Could PANDAS Be the Cause of the Mysterious Twitches in the Children of New York and St Louis? There have been several reports this week of a mysterious illness, which has affected children. Two dozen high school students suddenly reported that they were suffering from uncontrollable body movements and odd speech patterns in New York. On top of that, another dozen families in St. Louis said their children had similar symptoms. Could this be the same thing that Joshua Suthar went through? Lori Suthar hired me to write Joshua’s Missing Peace – A Mother’s True Story last year, after her son went through his ordeal. He had odd behavioral patterns, so she sought advice from her pediatrician, who recommended a neurologist, who recommended a psychiatrist. Lori followed the advice given, giving her son strong anti-psychotic drugs and almost lost Joshua. His personality changed, his aptitude for schoolwork took a nose dive and he became violent toward his siblings. Fortunately, Lori never gave up and continued to research and talk to other parents who experienced similar things. She discovered that her son had a very treatable illness called PANDAS. It is related to Strep Throat, if you can believe it. And yes, antibiotics are the cure. Sometimes, an additional treatment is needed, but the good news is that there is a solution for children with this illness. 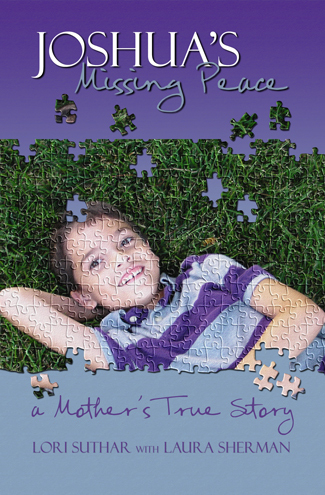 Joshua’s Missing Peace – A Mother’s True Story is now available and has attracted national attention. Why? Because people are looking for answers to why these children in New York and St. Louis have had sudden outbreaks of nervous tics. If it wasn’t for the research being done on PANDAS, the parents of these children might not realize that they could be dealing with a bacteria, something that is treatable. They won’t know until they do a simple strep test (which is very inexpensive and easy to do). I would hate to see any of those children go through the horrors that little Joshua did with all the drugs he was given. I am extremely proud to have been a part of this project. As Lori’s ghostwriter I was able to help her tell her story and get the message out there. I truly believe this book will help many families! Please pick up a copy of this book today! With this knowledge, you might just save a child’s life! Some clients will drop 300 pages of notes in my lap and ask me to write a book. Others will give me a rough concept of a story or nonfiction book and let me “have at it.” Which do I prefer? I love both! The first one is easier, faster, and more cut and dry. There are obvious advantages to this. However the second option gives me complete creative freedom. There’s something very appealing about that! Which option costs more? The latter would be more expensive, because it will take more time as extensive research is needed. Another important factor is time. Sometimes, a client will ask me to write a book in a month. I can do that, but I pretty much have to drop everything, kiss my husband and children goodbye, and find a cabin in the woods to rent to get it done. Okay, I’m exaggerating, but there is a nugget of truth to my hyperbole. This nearly impossible feat costs top dollar. Usually, a book takes six to eight months to write. Some clients don’t mind stretching the time line out to a year. Either way, the schedule is worked out well in advance. How involved is the “author” in their book? My answer to that is “How involved do they want to be?” My client is the boss. If they want to help me write their book, great! We’ll work together and I’ll share my knowledge with them. If they’d prefer to be hands-off and simply review the chapters as they roll off my keyboard, that works, too. What I will never do is write the entire book and then show it to the client. That is a recipe for disaster on many levels. It is very important to me that my client is happy with my work, as happy as they’d be if they had written it themselves. After all, their name is on the cover. They are the ones that will have to answer for each and every word. It is important that they love it! The first thing I do is outline the story and run it by the client. Once they sign off on the summary and outline, I begin writing the chapters of the book. After the first chapter or two are written, I send them to the client for review and wait. I won’t continue to write until I get their okay. Once I have it, I know we’re on the same page and I can start cranking out a rough draft. Once I’ve written another 50 to 100 pages I’ll show them the next segment. After all, we’ve now agreed to the structure and style, so I am confident that they will like it. The revisions should be minor at this point. One of the things I love about ghostwriting is that I get to work with many different people on many different projects. It is fun and challenging! I wish you all a magnificent 2012! I encourage you to set goals for this year and then take the steps needed to achieve them. You can do it! I have a special place in my heart for artists. If you are an artist (and I believe we all are), please take a moment to craft a few creative goals. If you’re a writer, please do write. And write. And write some more!